It's a moment Chicago Cubs fans will likely never forget: the team coming together on the field to celebrate its first World Series championship in 108 years. And now it's immortalized in a painting. 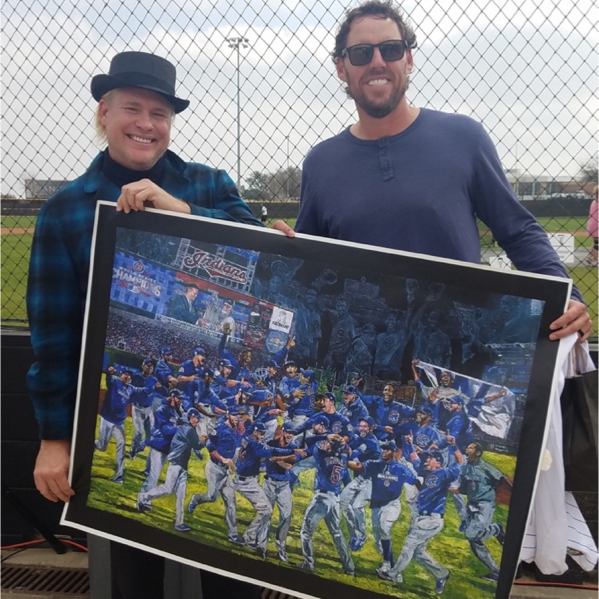 MLB-sanctioned artist Opie Otterstad, noted for his work depicting each of the last 15 World Series celebrations, has commemorated the Cubs' long-awaited win with the limited-edition piece "It Happened." The painting captures the moment after the final out in Game 7 against the Cleveland Indians, when the team mobbed the field for the first time as champions. Also unique to the painting are the ghosts of Cubs past, who can be seen in the night sky watching over Progressive Field. The painting and other works from the Cubs' historic win will be on public display at the Narrative Gallery inside Chicago's Water Tower Place on Saturday, April 8, from 6-9 p.m. CT and Sunday, April 9, from 1-4 p.m. CT the weekend prior to the Cubs' first home game on April 10, which will be televised on ESPN's Monday Night Baseball. Otterstad has more than 150 commissions to date, including many other of MLB's most historic moments. He's also been commissioned by the NBA, NFL and NCAA.